The Swale Fibromyalgia Support Group for Sittingboume & Sheppey, is a non profit making organisation. 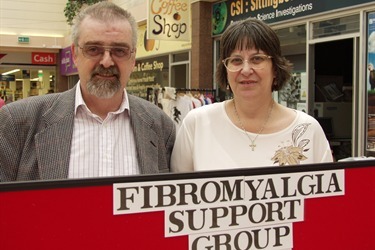 It was set up in 2009 by people with the condition to offer mutual support to those diagnosed with Fibromyalgia, and their Carers. We hold meetings bi-monthly, and provide a telephone helpline for Members and their Carers. We do not charge a Membership Fee as it is important that we are accessible to all, and not just to those who can afford it. We rely instead on voluntary donations and grants. is a chronic condition of widespread pain and fatigue. The pain tends to be felt as diffuse aching or burning, often described as head to toe. It may be worse at some times than others. The pain may also change location, usually be-coming more severe in parts of the body that are used the most. The fatigue ranges from feeling tired, to the exhaustion of a flu-like illness. It may come and go and people can suddenly feel drained of all energy - as if someone just "pulled the plug". Fibromyalgia Syndrome, also known as FMS for short, is a common illness. In fact, it is as common as Rheumatoid Arthritis and can be even more painful. The name Fibromyalgia is made up from "Fibro", for fibrous tissues such as tendons and ligaments; "My", indicating muscles; "Algia", meaning pain. Fibromyalgia is known as a syndrome be-cause it is a collection of symptoms rather than a specific disease process that is well understood. Besides the pain and fatigue, FMS symptoms often include non-refreshing sleep, headaches, cognitive dysfunction, anxiety, depression, clumsiness and dizziness, environmental sensitivity, allergies, and irritable bowel syndrome. Fibromyalgia Syndrome often develops after some sort of trauma that seems to act as a trigger, such as a fall, car accident, viral infection, childbirth, or an operation. Sometimes the condition begins without any obvious trigger. The actual cause of FMS has not yet been found, although research is ongoing. Research so far has indicated that most people with FMS are deprived of deep restorative sleep. It has also identified a deficiency in the neurotransmitters Serotonin in the Central Nervous System and a resulting imbalance in Substance P. The effect is Disordered Sensory Processing ( The brain registers pain when others might experience a slight ache or stiff¬ness). With these advances comes the added hope that a cause may be found and hence a cure or more effective treatment. FMS is not new, in the past it was difficult to diagnose. Part of the problem has been that the condition could not be identified in standard laboratory tests or x-rays. Also many of its signs and symptoms are found in other conditions as well - especially Chronic Fatigue Syndrome (CFS). Two Canadian doctors developed a way of diagnosing FMS in the 1970s and in 1990 an international committee published requirements for diagnosis that are now widely accepted. 2)	Pain in at least 11 of 18 specified tenderpoint sites when pressed. "Widespread pain" means pain above and below the waist and on both sides of the body. The "tenderpoints" or spots of extreme tenderness are rarely noticed by the patient until they are pressed. Many thanks to Margaret Robson for giving us permission to reprint information. For more information why not contact us, as we would be delighted to help you.